BetVictor has launched 'Season Ticket', an amazing welcome offer for the 2017-18 football season! Bet £10 and get a free acca every week! Correct! You will get £1 football accumulator bet every Saturday for 43 weeks (£43 in free bets) along with a £10 casino bonus to sweeten the deal further. 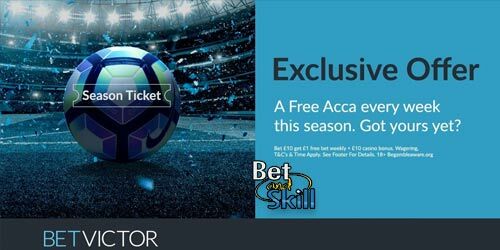 Find out how to get a free accumulator bet every week this season! 2. Opt in to this offer and place your first bet of £10 or more on any sporting event. 3. Receive up to £43 in Football Free Bets and £10 Casino Bonus Funds. Sign Up Today And Claim Your Welcome Offer! Plus, BetVictor are offering Price Promise - get the best price on 5+ folds acca. The Price Promise offer applies to all accumulators of five more teams and works in a similar way to the popular Best Odds Guaranteed in horse racing. Basically, if your football 5-fold or over win/lose/draw acca would have paid more at another bookie, you are sure BetVictor will pay you the difference you could have made elsewhere. BetVictor are obliged to establish that all customers are over the age of 18 within 72 hours of registration, if this cannot be completed automatically, you will be asked to provide documentation before any funds can be withdrawn, otherwise accounts will be suspended after 72 hours. Register your free account, opt-in and place your first bet of £10 or more at odds of evens (2.0) or greater on any sporting event within 7 days of registration to qualify. If you do not opt-in before placing your first bet, you will not qualify. Receive £10 Casino Bonus Funds and a £1 Football Free Bet (can be used on 5+ Folds football accas) on placement of your qualifying bet, which will expire after 7 days if not used. A further £1 Football Free Bet will be credited every Saturday by 10:00 UK time until 19th May 2018; Football Free Bets can be used on 5+ Folds football accas and expire after 2 days if not used. If you opt in, and/or activate this promotion after one or more game weeks have expired, bonus funds missed will not be backdated to the launch date of the promotion. Casino Bonus Funds can be used on any of our Casino games with the exception of Baccarat (all versions) and Blood Suckers slot and expire after 7 days if not used. See below for full Casino Bonus Terms and Conditions. This offer is valid from 10:00 UK time on 24.07.17 until 09:59 UK time on 02.10.2017, and is not open to existing, or past members of BetVictor, and cannot be used in conjunction with any other offer. Offer applies only to the first qualifying bet placed by new validated customers (excluding those who are subject to a bonus, sportsbook or residency restriction - More Info). 1 Qualifying bet per household. BetVictor reserves the right to remove Bonus Funds or void any open or settled bets if we believe a customer has, or is attempting to, abuse this offer. 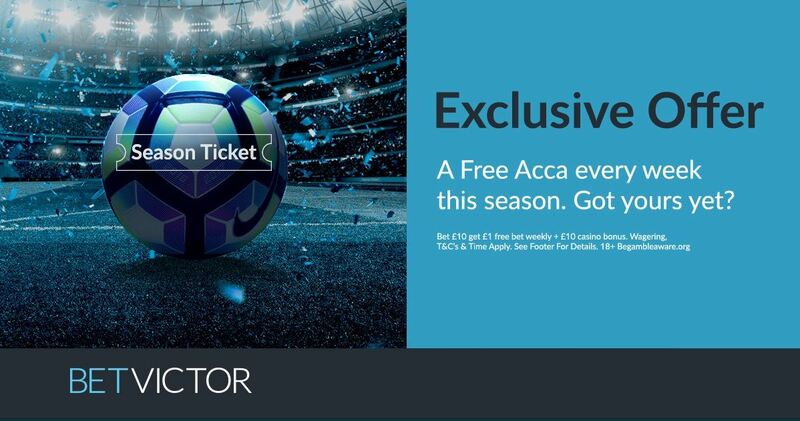 "BetVictor Season Ticket Offer: get a Free Acca Every Week!"